People with autism spectrum disorder (ASD) suffer from a profound social disability. Social neuroscience is the study of the parts of the brain that support social interactions or the “social brain.” This module provides an overview of ASD and focuses on understanding how social brain dysfunction leads to ASD. Our increasing understanding of the social brain and its dysfunction in ASD will allow us to better identify the genes that cause ASD and will help us to create and pick out treatments to better match individuals. Because social brain systems emerge in infancy, social neuroscience can help us to figure out how to diagnose ASD even before the symptoms of ASD are clearly present. This is a hopeful time because social brain systems remain malleable well into adulthood and thus open to creative new interventions that are informed by state-of-the-art science. Know the basic symptoms of ASD. Distinguish components of the social brain and understand their dysfunction in ASD. Appreciate how social neuroscience may facilitate the diagnosis and treatment of ASD. Autism Spectrum Disorder (ASD) is a developmental disorder that usually emerges in the first three years and persists throughout the individual’s life. Though the key symptoms of ASD fall into three general categories (see below), each person with ASD exhibits symptoms in these domains in different ways and to varying degrees. This phenotypic heterogeneity reflects the high degree of variability in the genes underlying ASD (Geschwind & Levitt, 2007). Though we have identified genetic differences associated with individual cases of ASD, each accounts for only a small number of the actual cases, suggesting that no single genetic cause will apply in the majority of people with ASD. There is currently no biological test for ASD. Autism is in the category of pervasive developmental disorders, which includes Asperger's disorder, childhood disintegrative disorder, autistic disorder, and pervasive developmental disorder - not otherwise specified. These disorders, together, are labeled autism spectrum disorder (ASD). ASD is defined by the presence of profound difficulties in social interactions and communication combined with the presence of repetitive or restricted interests, cognitions and behaviors. The diagnostic process involves a combination of parental report and clinical observation. Children with significant impairments across the social/communication domain who also exhibit repetitive behaviors can qualify for the ASD diagnosis. There is wide variability in the precise symptom profile an individual may exhibit. Figure 1. The red lines indicate the scan paths (collection of eye movements) used by people with (right column) and without (left column) autism to explore faces. Modified from Pelphrey et al., (2002). Since Kanner first described ASD in 1943, important commonalities in symptom presentation have been used to compile criteria for the diagnosis of ASD. These diagnostic criteria have evolved during the past 70 years and continue to evolve (e.g., see the recent changes to the diagnostic criteria on the American Psychiatric Association’s website, http://www.dsm5.org/), yet impaired social functioning remains a required symptom for an ASD diagnosis. Deficits in social functioning are present in varying degrees for simple behaviors such as eye contact, and complex behaviors like navigating the give and take of a group conversation for individuals of all functioning levels (i.e. high or low IQ). Moreover, difficulties with social information processing occur in both visual (e.g., Pelphrey et al., 2002) and auditory (e.g., Dawson, Meltzoff, Osterling, Rinaldi, & Brown, 1998) sensory modalities. Consider the results of an eye tracking study in which Pelphrey and colleagues (2002) observed that individuals with autism did not make use of the eyes when judging facial expressions of emotion (see right panels of Figure 1). While repetitive behaviors or language deficits are seen in other disorders (e.g., obsessive-compulsive disorder and specific language impairment, respectively), basic social deficits of this nature are unique to ASD. Onset of the social deficits appears to precede difficulties in other domains (Osterling, Dawson, & Munson, 2002) and may emerge as early as 6 months of age (Maestro et al., 2002). Within the past few decades, research has elucidated specific brain circuits that support perception of humans and other species. This social perception refers to “the initial stages in the processing of information that culminates in the accurate analysis of the dispositions and intentions of other individuals” (Allison, Puce, & McCarthy, 2000). Basic social perception is a critical building block for more sophisticated social behaviors, such as thinking about the motives and emotions of others. Brothers (1990) first suggested the notion of a social brain, a set of interconnected neuroanatomical structures that process social information, enabling the recognition of other individuals and the evaluation their mental states (e.g., intentions, dispositions, desires, and beliefs). The social brain is hypothesized to consist of the amygdala, the orbital frontal cortex (OFC), fusiform gyrus (FG), and the posterior superior temporal sulcus (STS) region, among other structures. Though all areas work in coordination to support social processing, each appears to serve a distinct role. The amygdala helps us recognize the emotional states of others (e.g., Morris et al., 1996) and also to experience and regulate our own emotions (e.g., LeDoux, 1992). The OFC supports the "reward" feelings we have when we are around other people (e.g., Rolls, 2000). The FG, located at the bottom of the surface of the temporal lobes detects faces and supports face recognition (e.g., Puce, Allison, Asgari, Gore, & McCarthy, 1996). The posterior STS region recognizes the biological motion, including eye, hand and other body movements, and helps to interpret and predict the actions and intentions of others (e.g., Pelphrey, Morris, Michelich, Allison, & McCarthy, 2005). The social brain is of great research interest because the social difficulties characteristic of ASD are thought to relate closely to the functioning of this brain network. Functional magnetic resonance imaging (fMRI) and event-related potentials (ERP) are complementary brain imaging methods used to study activity in the brain across the lifespan. Each method measures a distinct facet of brain activity and contributes unique information to our understanding of brain function. FMRI uses powerful magnets to measure the levels of oxygen within the brain, which vary according to changes in neural activity. As the neurons in specific brain regions “work harder”, they require more oxygen. FMRI detects the brain regions that exhibit a relative increase in blood flow (and oxygen levels) while people listen to or view social stimuli in the MRI scanner. The areas of the brain most crucial for different social processes are thus identified, with spatial information being accurate to the millimeter. In contrast, ERP provides direct measurements of the firing of groups of neurons in the cortex. Non-invasive sensors on the scalp record the small electrical currents created by this neuronal activity while the subject views stimuli or listens to specific kinds of information. While fMRI provides information about where brain activity occurs, ERP specifies when by detailing the timing of processing at the millisecond pace at which it unfolds. ERP and fMRI are complementary, with fMRI providing excellent spatial resolution and ERP offering outstanding temporal resolution. Together, this information is critical to understanding the nature of social perception in ASD. To date, the most thoroughly investigated areas of the social brain in ASD are the superior temporal sulcus (STS), which underlies the perception and interpretation of biological motion, and the fusiform gyrus (FG), which supports face perception. Heightened sensitivity to biological motion (for humans, motion such as walking) serves an essential role in the development of humans and other highly social species. Emerging in the first days of life, the ability to detect biological motion helps to orient vulnerable young to critical sources of sustenance, support, and learning, and develops independent of visual experience with biological motion (e.g., Simion, Regolin, & Bulf, 2008). This inborn “life detector” serves as a foundation for the subsequent development of more complex social behaviors (Johnson, 2006). From very early in life, children with ASD display reduced sensitivity to biological motion (Klin, Lin, Gorrindo, Ramsay, & Jones, 2009). Individuals with ASD have reduced activity in the STS during biological motion perception. Similarly, people at increased genetic risk for ASD but who do not develop symptoms of the disorder (i.e. unaffected siblings of individuals with ASD) show increased activity in this region, which is hypothesized to be a compensatory mechanism to offset genetic vulnerability (Kaiser et al., 2010). In typical development, preferential attention to faces and the ability to recognize individual faces emerge in the first days of life (e.g., Goren, Sarty, & Wu, 1975). The special way in which the brain responds to faces usually emerges by three months of age (e.g., de Haan, Johnson, & Halit, 2003) and continues throughout the lifespan (e.g., Bentin et al., 1996). Children with ASD, however, tend to show decreased attention to human faces by six to 12 months (Osterling & Dawson, 1994). Children with ASD also show reduced activity in the FG when viewing faces (e.g., Schultz et al., 2000). Slowed processing of faces (McPartland, Dawson, Webb, Panagiotides, & Carver, 2004) is a characteristic of people with ASD that is shared by parents of children with ASD (Dawson, Webb, & McPartland, 2005) and infants at increased risk for developing ASD because of having a sibling with ASD (McCleery, Akshoomoff, Dobkins, & Carver, 2009). Behavioral and attentional differences in face perception and recognition are evident in children and adults with ASD as well (e.g., Hobson, 1986). Because of the limited quality of the behavioral methods used to diagnose ASD and current clinical diagnostic practice, which permits similar diagnoses despite distinct symptom profiles (McPartland, Webb, Keehn, & Dawson, 2011), it is possible that the group of children currently referred to as having ASD may actually represent different syndromes with distinct causes. Examination of the social brain may well reveal diagnostically meaningful subgroups of children with ASD. Measurements of the “where” and “when” of brain activity during social processing tasks provide reliable sources of the detailed information needed to profile children with ASD with greater accuracy. These profiles, in turn, may help to inform treatment of ASD by helping us to match specific treatments to specific profiles. The integration of imaging methods is critical for this endeavor. Using face perception as an example, the combination of fMRI and ERP could identify who, of those individuals with ASD, shows anomalies in the FG and then determine the stage of information processing at which these impairments occur. Because different processing stages often reflect discrete cognitive processes, this level of understanding could encourage treatments that address specific processing deficits at the neural level. For example, differences observed in the early processing stages might reflect problems with low-level visual perception, while later differences would indicate problems with higher-order processes, such as emotion recognition. These same principles can be applied to the broader network of social brain regions and, combined with measures of behavioral functioning, could offer a comprehensive profile of brain-behavior performance for a given individual. A fundamental goal for this kind of subgroup approach is to improve the ability to tailor treatments to the individual. Another objective is to improve the power of other scientific tools. Most studies of individuals with ASD compare groups of individuals, for example, individuals on with ASD compared to typically developing peers. However, studies have also attempted to compare children across the autism spectrum by group according to differential diagnosis (e.g., Asperger’s disorder versus autistic disorder), or by other behavioral or cognitive characteristics (e.g., cognitively able versus intellectually disabled or anxious versus non-anxious). Yet, the power of a scientific study to detect these kinds of significant, meaningful, individual differences is only as strong as the accuracy of the factor used to define the compared groups. The identification of distinct subgroups within the autism spectrum according to information about the brain would allow for a more accurate and detailed exposition of the individual differences seen in those with ASD. This is especially critical for the success of investigations into the genetic basis of ASD. As mentioned before, the genes discovered thus far account for only a small portion of ASD cases. If meaningful, quantitative distinctions in individuals with ASD are identified; a more focused examination into the genetic causes specific to each subgroup could then be pursued. Moreover, distinct findings from neuroimaging, or biomarkers, can help guide genetic research. Endophenotypes, or characteristics that are not immediately available to observation but that reflect an underlying genetic liability for disease, expose the most basic components of a complex psychiatric disorder and are more stable across the lifespan than observable behavior (Gottesman & Shields, 1973). By describing the key characteristics of ASD in these objective ways, neuroimaging research will facilitate identification of genetic contributions to ASD. Because autism is a developmental disorder, it is particularly important to diagnose and treat ASD early in life. Early deficits in attention to biological motion, for instance, derail subsequent experiences in attending to higher level social information, thereby driving development toward more severe dysfunction and stimulating deficits in additional domains of functioning, such as language development. The lack of reliable predictors of the condition during the first year of life has been a major impediment to the effective treatment of ASD. Without early predictors, and in the absence of a firm diagnosis until behavioral symptoms emerge, treatment is often delayed for two or more years, eclipsing a crucial period in which intervention may be particularly successful in ameliorating some of the social and communicative impairments seen in ASD. In response to the great need for sensitive (able to identify subtle cases) and specific (able to distinguish autism from other disorders) early indicators of ASD, such as biomarkers, many research groups from around the world have been studying patterns of infant development using prospective longitudinal studies of infant siblings of children with ASD and a comparison group of infant siblings without familial risks. Such designs gather longitudinal information about developmental trajectories across the first three years of life for both groups followed by clinical diagnosis at approximately 36 months. These studies are problematic in that many of the social features of autism do not emerge in typical development until after 12 months of age, and it is not certain that these symptoms will manifest during the limited periods of observation involved in clinical evaluations or in pediatricians’ offices. Moreover, across development, but especially during infancy, behavior is widely variable and often unreliable, and at present, behavioral observation is the only means to detect symptoms of ASD and to confirm a diagnosis. This is quite problematic because, even highly sophisticated behavioral methods, such as eye tracking (see Figure 1), do not necessarily reveal reliable differences in infants with ASD (Ozonoff et al., 2010). However, measuring the brain activity associated with social perception can detect differences that do not appear in behavior until much later. The identification of biomarkers utilizing the imaging methods we have described offers promise for earlier detection of atypical social development. ERP measures of brain response predict subsequent development of autism in infants as young as six months old who showed normal patterns of visual fixation (as measured by eye tracking) (Elsabbagh et al., 2012). This suggests the great promise of brain imaging for earlier recognition of ASD. With earlier detection, treatments could move from addressing existing symptoms to preventing their emergence by altering the course of abnormal brain development and steering it toward normality. The brain imaging research described above offers hope for the future of ASD treatment. Many of the functions of the social brain demonstrate significant plasticity, meaning that their functioning can be affected by experience over time. In contrast to theories that suggest difficulty processing complex information or communicating across large expanses of cortex (Minshew & Williams, 2007), this malleability of the social brain is a positive prognosticator for the development of treatment. The brains of people with ASD are not wired to process optimally social information. But this does not mean that these systems are irretrievably broken. Given the observed plasticity of the social brain, remediation of these difficulties may be possible with appropriate and timely intervention. Web: Autism Science Foundation - organization supporting autism research by providing funding and other assistance to scientists and organizations conducting, facilitating, publicizing and disseminating autism research. The organization also provides information about autism to the general public and serves to increase awareness of autism spectrum disorders and the needs of individuals and families affected by autism. How can neuroimaging inform our understanding of the causes of autism? What are the ways in which neuroimaging, including fMRI and ERP, may benefit efforts to diagnosis and treat autism? How can an understanding of the social brain help us to understand ASD? What are the core symptoms of ASD, and why is the social brain of particular interest? What are some of the components of the social brain, and what functions do they serve? A characteristic that reflects a genetic liability for disease and a more basic component of a complex clinical presentation. Endophenotypes are less developmentally malleable than overt behavior. Measures the firing of groups of neurons in the cortex. As a person views or listens to specific types of information, neuronal activity creates small electrical currents that can be recorded from non-invasive sensors placed on the scalp. ERP provides excellent information about the timing of processing, clarifying brain activity at the millisecond pace at which it unfolds. Entails the use of powerful magnets to measure the levels of oxygen within the brain that vary with changes in neural activity. That is, as the neurons in specific brain regions “work harder” when performing a specific task, they require more oxygen. By having people listen to or view social percepts in an MRI scanner, fMRI specifies the brain regions that evidence a relative increase in blood flow. In this way, fMRI provides excellent spatial information, pinpointing with millimeter accuracy, the brain regions most critical for different social processes. The set of neuroanatomical structures that allows us to understand the actions and intentions of other people. Allison, T., Puce, A., & McCarthy, G. (2000). Social perception from visual cues: Role of the STS region. Trends in Cognitive Science, 4(7), 267–278. Bentin, S., Allison, T., Puce, A., Perez, E., et al. (1996). Electrophysiological studies of face perception in humans. Journal of Cognitive Neuroscience, 8(6), 551–565. Dawson, G., Meltzoff, A. N., Osterling, J., Rinaldi, J., & Brown, E. (1998). Children with autism fail to orient to naturally occurring social stimuli. Journal of Autism & Developmental Disorders, 28(6), 479–485. Dawson, G., Webb, S. J., & McPartland, J. (2005). Understanding the nature of face processing impairment in autism: Insights from behavioral and electrophysiological studies. Developmental Neuropsychology, 27(3), 403–424. Elsabbagh, M., Mercure, E., Hudry, K., Chandler, S., Pasco, G., Charman, T., et al. (2012). Infant neural sensitivity to dynamic eye gaze is associated with later emerging autism. Current Biology, 22(4), 338–342. Geschwind, D. H., & Levitt, P. (2007). Autism spectrum disorders: Developmental disconnection syndromes. Current Opinion in Neurobiology, 17(1), 103–111. Goren, C. C., Sarty, M., & Wu, P. Y. (1975). Visual following and pattern discrimination of face-like stimuli by newborn infants. Pediatrics, 56(4), 544–549. Gottesman I. I., & Shields, J. (1973) Genetic theorizing and schizophrenia. British Journal of Psychiatry, 122, 15–30. Hobson, R. (1986). The autistic child’s appraisal of expressions of emotion. Journal of Child Psychology and Psychiatry, 27(3), 321–342. Johnson, M. H. (2006). Biological motion: A perceptual life detector? Current Biology, 16(10), R376–377. Kaiser, M. D., Hudac, C. M., Shultz, S., Lee, S. M., Cheung, C., Berken, A. M., et al. (2010). Neural signatures of autism. Proceedings of the National Academy of Sciences of the United States of America, 107(49), 21223–21228. Klin, A., Lin, D. J., Gorrindo, P., Ramsay, G., & Jones, W. (2009). Two-year-olds with autism orient to non-social contingencies rather than biological motion. Nature, 459(7244), 257–261. Maestro, S., Muratori, F., Cavallaro, M. C., Pei, F., Stern, D., Golse, B., et al. (2002). Attentional skills during the first 6 months of age in autism spectrum disorder. Journal of the American Academy of Child and Adolescent Psychiatry, 41(10), 1239–1245. McCleery, J. P., Akshoomoff, N., Dobkins, K. R., & Carver, L. J. (2009). Atypical face versus object processing and hemispheric asymmetries in 10-month-old infants at risk for autism. Biological Psychiatry, 66(10), 950–957. McPartland, J. C., Dawson, G., Webb, S. J., Panagiotides, H., & Carver, L. J. (2004). Event-related brain potentials reveal anomalies in temporal processing of faces in autism spectrum disorder. Journal of Child Psychology and Psychiatry, 45(7), 1235–1245. McPartland, J. C., Webb, S. J., Keehn, B., & Dawson, G. (2011). Patterns of visual attention to faces and objects in autism spectrum disorder. Journal of Autism and Develop Disorders, 41(2), 148–157. Minshew, N. J., & Williams, D. L. (2007). The new neurobiology of autism: Cortex, connectivity, and neuronal organization. Archives of Neurology, 64(7), 945–950. Osterling, J., & Dawson, G. (1994). Early recognition of children with autism: A study of first birthday home videotapes. Journal of Autism and Developmental Disorders, 24, 247-257. Osterling, J. A., Dawson, G., & Munson, J. A. (2002). Early recognition of 1-year-old infants with autism spectrum disorder versus mental retardation. Development & Psychopathology, 14(2), 239–251. Ozonoff, S., Iosif, A. M., Baguio, F., Cook, I. C., Hill, M. M., Hutman, T., et al. (2010). A prospective study of the emergence of early behavioral signs of autism. Journal of the American Academy of Child and Adolescent Psychiatry, 49(3), 256–266. Pelphrey, K. A., Sasson, N. J., Reznick, J. S., Paul, G., Goldman, B. D., & Piven, J. (2002). Visual scanning of faces in autism. Journal of Autism & Developmental Disorders, 32(4), 249–261. Schultz, R. T., Gauthier, I., Klin, A., Fulbright, R. K., Anderson, A. W., Volkmar, F., et al. (2000). Abnormal ventral temporal cortical activity during face discrimination among individuals with autism and Asperger syndrome. Archives of General Psychiatry, 57(4), 331–340. Simion, F., Regolin, L., & Bulf, H. (2008). A predisposition for biological motion in the newborn baby. Proceedings of the National Academy of Sciences, 105(2), 809–813. de Haan, M., Johnson, M. H., & Halit, H. (2003). Development of face-sensitive event-related potentials during infancy: A review. International Journal of Psychophysiology, 51(1), 45–58. 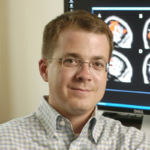 Dr. Kevin Pelphrey is the Harris Professor in the Yale Child Study Center and director of the Center for Translational Developmental Neuroscience and Center for Excellence in Autism Research and Treatment. His research focuses on the application of cognitive neuroscience and genetics to understanding the systems biology of neurodevelopmental disorders. Autism: Insights from the Study of the Social Brain by Kevin A. Pelphrey is licensed under a Creative Commons Attribution-NonCommercial-ShareAlike 4.0 International License. Permissions beyond the scope of this license may be available in our Licensing Agreement.